Renderings offer a new look at the proposed Lucas Museum along Chicago's lakefront. CHICAGO -- A federal judge has told a nonprofit group trying to stop "Star Wars'" filmmaker George Lucas from building a $400 million museum in Chicago to respond to the city's request to dismiss its lawsuit. The Chicago Tribune reports U.S. District Judge John Darrah set the next hearing for February. Friends of the Parks argues the museum will violate the public trust because it'll be built on reclaimed land that was once Lake Michigan. 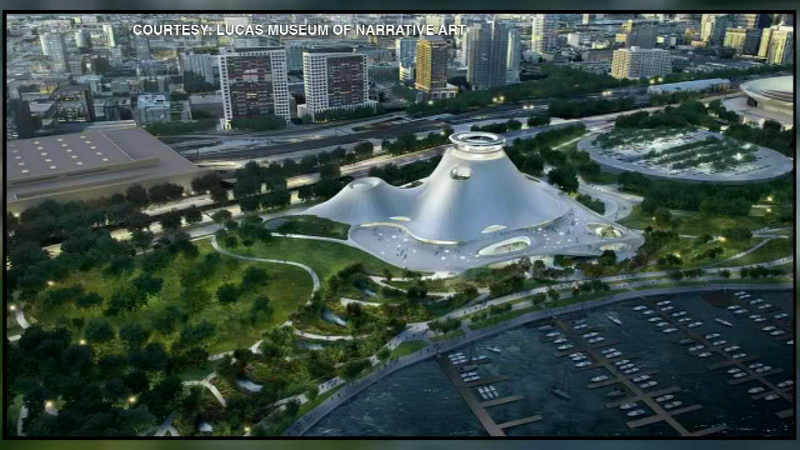 The Lucas Museum of Narrative Art is set to be built near Soldier Field. The plan already was revised to shrink the building and allow more green space on the lakefront site. The museum could open as soon as 2019. Lucas' choice of Chicago as the site was considered a coup for Mayor Rahm Emanuel.